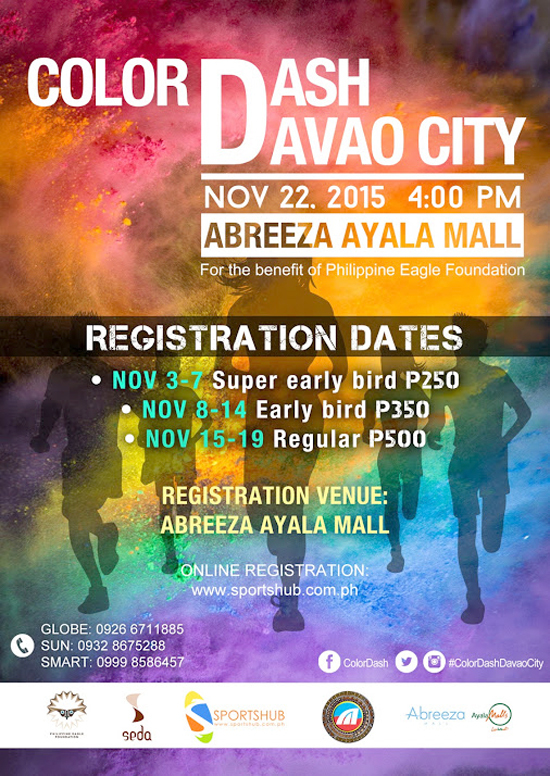 Great news to all running enthusiasts of Davao City, Color Dash, Manila’s most colourful race will be splashing colours and fun here in Davao on November 22, 2015. 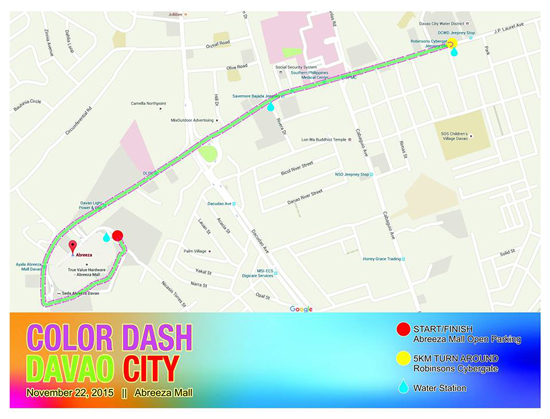 On its third year, Color Dash decides to hold its colour race here in the city to let Davaoenos experience the atmosphere of excitement in colours as the fun run happens. This themed 5-kilometer run is a non-competitive fun run; however, there will be special prizes for groups and individuals who will be exhibiting fun antics and frolics while on the run. There will be splashes of colours every kilometre to make the run even more enjoyable. The splatters of colours, however, are food grade and are safe even for children and pets, said Kaye Rey, the Event Organizer. And to make your run even more worthwhile, Color Dash has partnered with Philippine Eagle Foundation. Part of the registration fee will go straight to the foundation to help educate the public and spread the news of the significance of our endangered National Bird. But If you do not feel like going to the mall, you can register online through www.sportshub.com.ph and claim your running kit during the event or you can opt for delivery of your kit to your house, office, or school. Your registration fee includes a shirt, goggles and a race bib. This event is organized by Sportshub, an online store for sporting goods and will be spearheaded by Mulatto, a proud Davao-born outdoor apparel. And oh wait, the fun doesn't end on the streets, everyone is enjoined to finish the race for the traditional display of colors to cap the event and to celebrate with fellow color dashers.